Minford senior Luke Lindamood signed his letter of intent Monday to play collegiate baseball at West Virginia University Institute of Technology in Beckley, West Virginia beginning next spring. 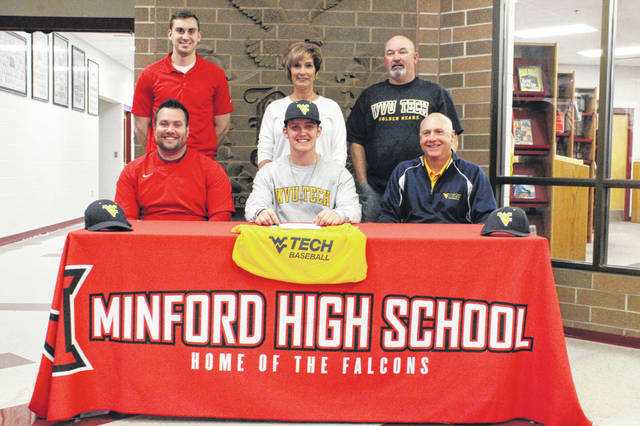 MINFORD – Minford senior Luke Lindamood made his plans official at his signing ceremony Monday afternoon: to enroll and play collegiate baseball at West Virginia University Institute of Technology (WVU Tech) in Beckley, West Virginia following his graduation from Minford this spring. Lindamood has starred behind the plate from his catcher’s position for the Falcons during his time in the red and white, helping Minford get their first outright conference championship in baseball in 50 years and first regional title in school history, while also playing under head football coach Jesse Ruby on the gridiron. When it came time to decide on where he would spend his next four years, Lindamood said it was the winning tradition at WVU Tech and academic factors that ultimately steered him towards playing for the Golden Bears next spring. But before Lindamood joins the Golden Bears next season, he still has some unfinished business he’d like to take care off before taking off the Falcon jersey for a final time.